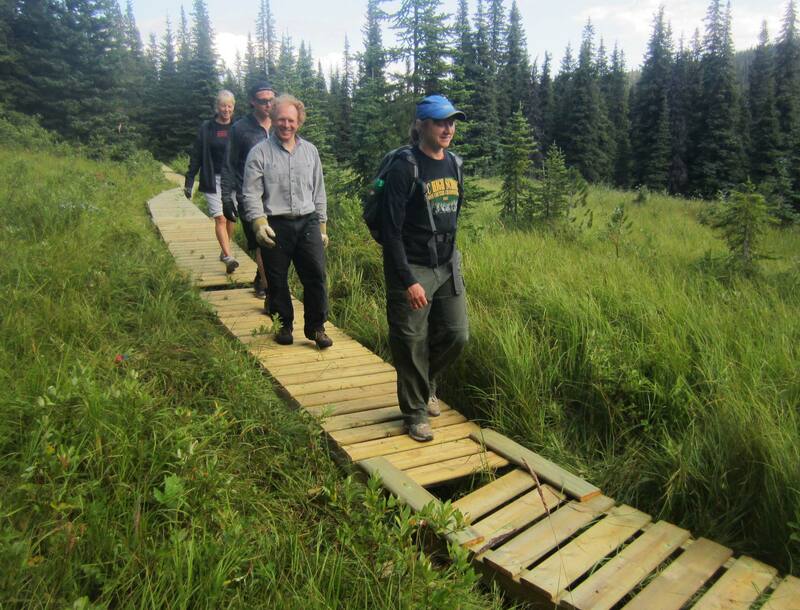 2500 screws – that is how many it took for a team of volunteers from the Wolverine Nordic & Mountain Society (WNMS) to construct twenty-seven 12-foot-long boardwalks in the Helm backyard. Their destination: the trail to Babcock Falls, so as to enhance this popular destination for hikers and at the same time protect the fragile wet subalpine meadows. Wood was bought locally at Tru Hardware, where Dean Turner cut all the decking into thirty-inch lengths as a generous donation. Bill Woods of Megmar offered a great rate for WNMS as a non-profit group, in transporting the boardwalks on the back of the tow truck from town to the trailhead. Marc Bresse of Ridge Rotors was an excellent helicopter pilot, long-lining the boardwalks in and placing them perfectly in position. Peace River Coal (Bruce Gavin and Lizette Greyling) provided support and ensured that there were no blasts while the chopper was flying. Tim Bennett at BC Rec Sites & Trails found funding to partially cover the costs, and proceeds from the Emperor’s Challenge were used to cover the remainder. Anyone who supported the Emperor’s Challenge is therefore in a real sense a contributor. It was my privilege to co-ordinate this project, and great credit must go to the remarkable volunteers. Fred and Shawna Booker made two trips from Mackenzie specifically to work on this endeavour. They were joined by Brandon Braam; Thomas Clark; Doug Foerster; Linda Helm; Paul Nesbitt; Dawn, Gilles and Justin Pouliot; and Larry White. Their combined skills, dedication and muscle-power are an extraordinary asset to our community. The job got done without a hitch on August 19th, and the result is 120 metres of boardwalk that make the trail a drier and far more enjoyable experience. What is the best way to thank these volunteers and donors for their efforts? That’s simple: why not go and hike the trail to Babcock Falls, enjoy the fruits of their labours, and then encourage a few friends to do likewise?